The comments on my initial post on this topic went right at the VC’s compensation – management fees and carry – and their impact on returns. So at Ken Berger’s suggestion, I will change my planned post for today and address the issue head on. The returns venture firms get on their investments are called "gross returns". I didn’t mention them in my post yesterday because I wanted to focus on the "net" returns to the LPs. I said 2x was the lowest attractive return on a venture fund and I meant net to the LPs. That means if you invest a dollar in the fund, you get two dollars back. However, the fund has to get a lot more than $2 back on its investments to get its investors $2 back. That’s because before the investors get their money back, the fund takes a management fee. And if there are profits, the managers of the fund take a carried interest on the profits. Our fund takes 20% and that is the carried interest that most funds take. However, there are funds that charge 25% or even 30% carried interest fees. Some think the best funds charge the highest carried interest fees. Market theory would suggest that is true. But I am not sure that it is. I think we have a very good firm and we charge a standard carry. But that’s for another day, if at all. It’s a tricky subject to talk about. The management fees don’t go directly to the fund managers. They pay for the costs of running the business. On small funds, that’s about all they pay for. On big funds, the management fees can get large enough to pay very significant salaries to the fund managers. Management fees are all over the map but range from 1.5% per year for large funds to 2.5% per year for smaller funds. And they typically tail off after the first five years to much lower percentages to reflect that the work of putting the fund to work is largely over. The carried interest is only paid on gains. So if they fund makes no money, no carried interest is paid. But if the gains are large, the carry will be large too. 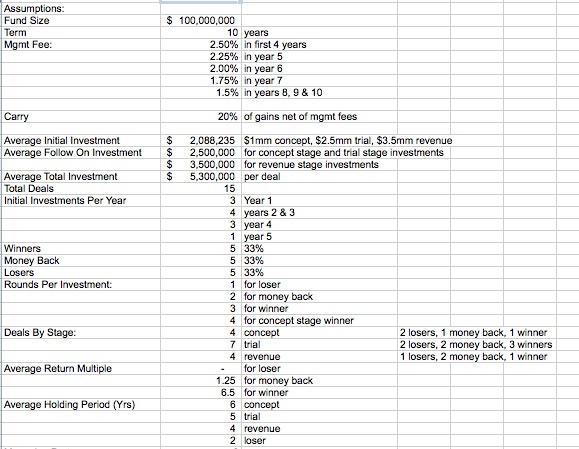 Back in 2003, when Brad and I started Union Square Ventures, we built a model of our fund to show how we thought the fund economics could work. At that time, we planned a $100mm fund. We ultimately raised a $125mm fund. But the model I am going to talk about is based on a $100mm fund. I am not going to address all those assumptions in this post but if you have questions, post them in the comments and I will respond to them. This model is basically our game plan. Some things changed in our execution of the fund, namely we raised $125mm, and we invested even less in the initial investment of "concept" investments, and we did more rounds for those really early stage companies. So we did 21 investments instead of 15 and we did more rounds of smaller amounts. But even though those seem like big changes, they did not effect the main drivers of fund capital allocation very much. It looks like the average investment amount will come in close to what we modeled and it looks like the capital allocation between seed, first round, and later stage investments will come in pretty close. Right now we are doing much better than 1/3, 1/3, 1/3 hit rate, but let’s wait until it’s all over to see how that comes out. You just never know in the venture business. So to make it really simple, a fund needs to get 4x (in this case $322mm on $80mm of invested captial) on its investments to generate 2.5x in distributions to its limited partners. Paul Margolis of Longworth Ventures did a post a year and half ago on this topic and came up with similar numbers (although the difference between gross and net in his post are lower than mine). The differences between gross returns and net returns are large in the venture and private equity business and it’s important to understand them and be clear about what numbers you are using when you talk about returns.